The latest edition of the WA’s food bible is out! The Good Food Guide is a celebration of all that is excellent in the WA dining scene across all areas of cooking, entrepreneurship, wine and service – and the go-to for anyone serious about eating and drinking well in our fabulous state. The food bible’s recommendation for food inspiration in the Bunbury Geographe – Market Eating House in Victoria Street, Bunbury. Their commitment to the ethos of share-style eating and happy free-for-all dining reserved Market Eating House a spot in their Top 25 Casual Dining Restaurants. So, make Market Eating House your go-to eat destination! “Brenton and Bec Pyke have raised the standard of Bunbury dining, since making the southern port city their home several years ago. 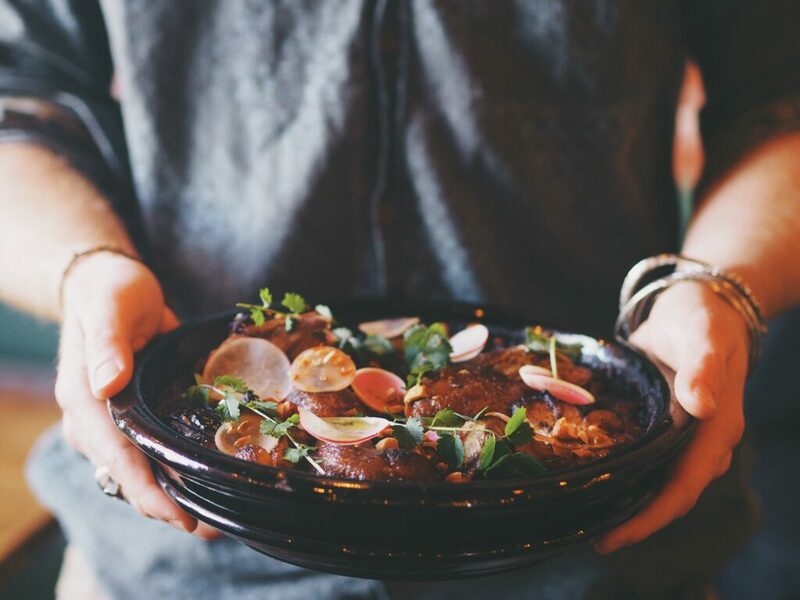 Their casual, focused diner, Market Eating House, pushes a menu with Greek and Levantine leanings, pointing to Pike’s time as head chef at George Calombaris’ Little Press & Cellar in Melbourne. Wife, Bec, equally savvy on the other side of the dining coin, has a focus on service. You can order off the card but those who try the “feed me” menus will be well rewarded. These menus embody the Market Eating House ethos: share-style eating, with multiple dishes on the table, and happy free-for-all dining. Pike’s plates are among the best you’ll find south of Perth. Simple hummus is lifted with a ground lamb, ras el hanout and raisin topping. Greek saganaki cheese hits the table sizzling in a skillet. Fragrant notes of lemon, honey and oregano the opening gambit for a dish that’s acidic and sweet.